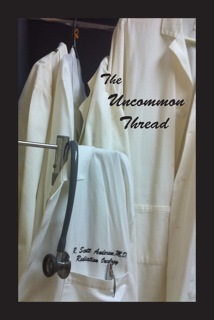 For the past three years The Uncommon Thread has been one of the most popular regular features of the JOURNAL: of the Mississippi State Medical Association. Only a state with a literary tradition as rich as Mississippi’s would dedicate a regular column to literary exploration as part of its monthly scientific medical journal. A strong literary commitment is not something new for the JOURNAL; The Uncommon Thread sprang fully formed from its progenitor Una Voce, which now continues under the pen of its founder Dr. Dwalia South. But, for two years a madman held Una Voce captive while its true author was serving as the president of the Association and then engaged in both her own and her husband’s battles with cancer. By the time she recovered and returned to restore sanity to her own column, the editors were stuck trying to find someplace to put a stream of consciousness gadfly that somehow continued to charm at least as many readers as he antagonized.